Moritz Bleibtreu wears black high top Converse “Chuck Taylor” All Stars in the film. Lola is running to meet up with Manni. Run Lola Run is not simply watched—it’s experienced. The film dives headfirst into the plot as Lola (Franka Potente) receives a distressed phone call from her boyfriend Manni (Moritz Bleibteu), a petty criminal who needs to turn over a chunk of money or face death. But there’s a twist: he only has twenty minutes. Cue Lola’s mad sprint across town in a race against the clock, with the added challenge of somehow acquiring the cash to save Manni’s life. The moment Lola’s heels strike the Berlin pavement, complete with flame red hair trailing behind, your own heartbeat vicariously quickens as the risks keep mounting. The film presents three separate scenarios of Lola’s twenty minute stretch, reversing to the start every time with new storylines that guarantee to leave your mind somersaulting. Manni is in a phone booth desperately trying to reach Lola. The film’s essence lives in the cascades of “what ifs” that greatly alter the outcome and quite literally determine life or death. And not just for Lola and Mannie—a change in Lola’s strategy flips the fate of all the seemingly background characters in her world. The same bystander characters are presented in each of the three situations, allowing the audience to create a connection to their stories and the tangled web they form together. Flashes of the future for each minor character add an extra human element to the film, and showcase how every small move in life matters. The multiple storylines intersect in real-time, and the same scenes are shown repeatedly with minor changes, giving an eerie sense of déjà vu. 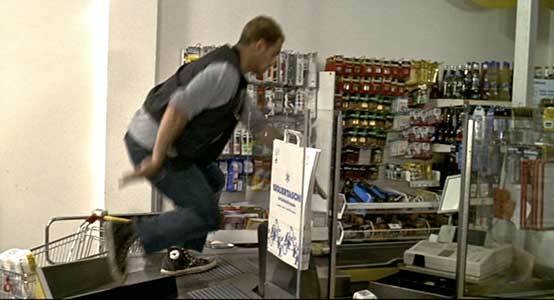 Manni jumps on the checkout stand at the store to get to the cash register. Besides the transforming lives of the bystanders, the most intriguing changes occur within Lola’s personal relationships. Through flashbacks and memories, viewers learn intimate details of Lola’s relationship with Manni, and begin to appreciate the outlandish couple and the bond they share. Moreover, the role of Lola’s callous father (Herbert Knaup) is morphed in each scene, alongside his intentions with Lola and his mistress. By learning of Lola’s private life, she develops into a softer character despite her harsh exterior. Again, like with the bystander stories, the human element is highlighted successfully—an unexpected feat for an action based film. Manni and Lola are running away from the police. Director Tom Tykwer deserves a personal applause for his accomplishments in Run Lola Run, which itself has rightfully garnered numerous industry awards. Tykwer distinguishes himself by upping the ante on other action packed dramas by adding flair of the supernatural and an artistic quality to every detail. From the mix of sound and silence, the effective use of black and white to allude to the past, and the switch to animation in select scenes, the audience is kept on its toes. Camera direction plays an essential role in the intrigue, with fast movements that trick the eyes and usher the anxiety of the characters into the viewers. Run Lola Run is indeed a thriller, but one goes above and beyond its duty of simple entertainment by leaving you with a lingering existentialist thought—perhaps life truly is a game of roulette. Manni grieves over Lola after she was shot in the street. Lola kicks her gun over to Manni. Moritz Bleibtreu in his role as Manni wears well worn black high top chucks throughout the film. 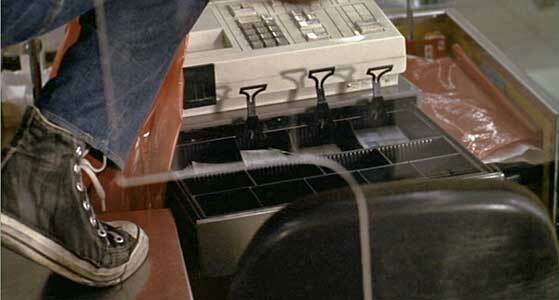 The best closeups are during the store robbery scene where the camera shows a gun kicked over to Manni and Manni gathering up cash after climbing up a checkout stand. Manni is geting cash from the register. Run Lola Run. (1998) Franka Potente, Moritz Bleibtreu, Herbert Knaup, Armin Rohde, Joachim Krol.